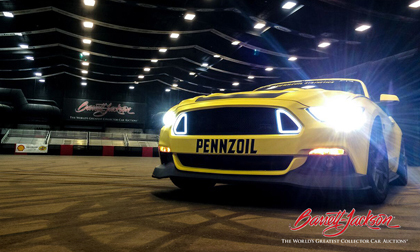 SCOTTSDALE, ARIZ. – Jan. 10, 2017 – Barrett-Jackson, The World’s Greatest Collector Car Auctions®, teamed up with Pennzoil and World Champion drifter and professional “fun-haver” Vaughn Gittin Jr. to film “No Reserve Drifting,” a wild drifting video shot on-site at WestWorld of Scottsdale. “No Reserve Drifting” was released today and can be streamed online at http://www.barrett-jackson.com/Media/Home/Video/198898576. The video was shown for the first time today during an exclusive media reception for the 46th Annual Barrett-Jackson Scottsdale Auction. The stage for “No Reserve Drifting” was Barrett-Jackson’s long-standing auction site, WestWorld of Scottsdale. Throughout the huge auction site, Gittin is shown piloting his 2017 Monster Energy Nitto Tire Ford Mustang RTR through harrowing hairpin turns and calculated donuts that demonstrate his natural dexterity behind the wheel. Many cameras, including a drone shooting aerial footage, captured what Pennzoil Synthetics and 450 powerfully agile horses can accomplish when shod with Nitto NT555 G2 tires. The Ford Mustang RTR Spec 2 piloted by Gittin is available with up to 670 horsepower and features modern aggressive styling and performance upgrades including fully adjustable suspension and is available globally at select Ford dealers. Guests attending the 2017 Barrett-Jackson Scottsdale Auction are encouraged to be on the lookout for Gittin’s “performance art” ‒ the equivalent of 360,000 miles of tracks left behind by the Nitto NT 555 G2 tires. For more information on becoming a bidder, follow the link to www.barrett-jackson.com/bid. Experience the 46th Annual Scottsdale Auction in style with a Barrett-Jackson VIP Experience Package. Information on available packages and how to be a part of this world-class lifestyle event is available here. The term ‘Shell Lubricants’ collectively refers to the companies of Royal Dutch Shell plc that are engaged in the lubricants business. Shell Lubricants companies lead the lubricants industry, supplying more than 12% of global lubricants volume. * The companies manufacture and blend products for use in consumer, heavy industrial and commercial transport applications. The Shell Lubricants portfolio of top-quality brands includes Pennzoil®, Quaker State®, FormulaShell®, Shell TELLUS®, Shell RIMULA®, Shell ROTELLA® T, Shell SPIRAX® , Shell Gadus® and Jiffy Lube®.